The graphic below illustrates how there are different levels of activism, based on a person’s contribution to the cause that they are supporting. Detractors and misinformation are depicted as black clouds looming over the pyramid, to represent how they can be a setback to activist progress (I will explain more about this below). Champions may seem like the ideal or most admirable of activists – after all, they are on the top of the pyramid – but the graphic is intended to depict what they are contributing to the cause and the number of them that exist, not their value as human beings. In fact, it takes a considerable amount of luck and/or privilege to because a champion for a cause. Being a community organizer, advocate, or direct service worker is not a very lucrative career, and often requires advanced education in social service, public policy, environmental studies, or a related subject. This means that many champions come from a background of wealth and a family that values education, which can lead them down this path (although I suppose we can forgive them for that). Supporters make up the middle of the pyramid, and give causes what they need to be successful – money and manpower. Even within this section, how high a person falls on the pyramid will depend on how great a contribution they have made to the cause. Once again, a higher contribution has the potential for a greater social impact, however, it requires a relative privilege to ascend these ranks. People who fall higher up on the pyramid have a great responsiblity to listen to the people they are trying to help and consider their voice while working to affect change. Sharers are the base of the pyramid – they are numerous and play an important role by raising awareness of the work of champions and supporters. 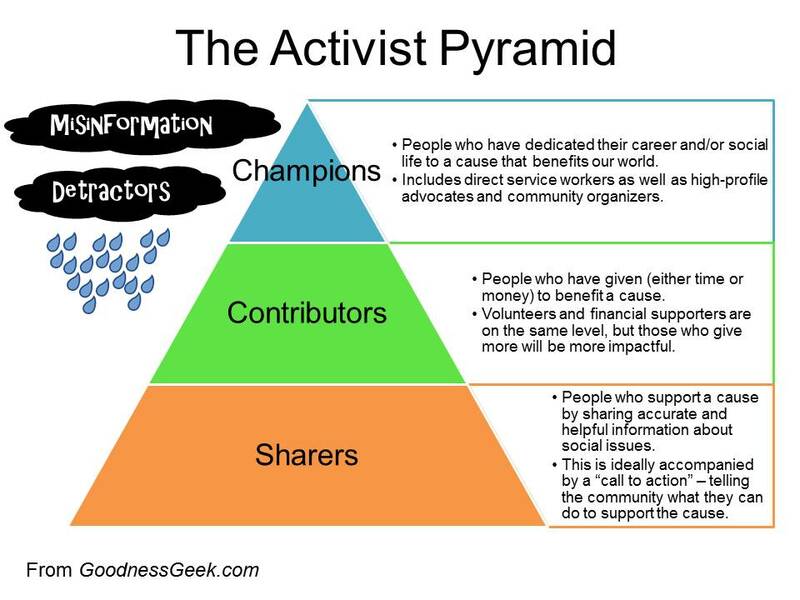 By spreading awareness, sharers actually widen the activist pyramid, recruiting new members of the community to join the cause. They also have the potential to move up the pyramid and become supporters once they acquire the resources and motivation necessary to do so (you need both!). To affect positive social change as a sharer, you must share information that is accurate and motivating (see my post Beyond Slacktivism). 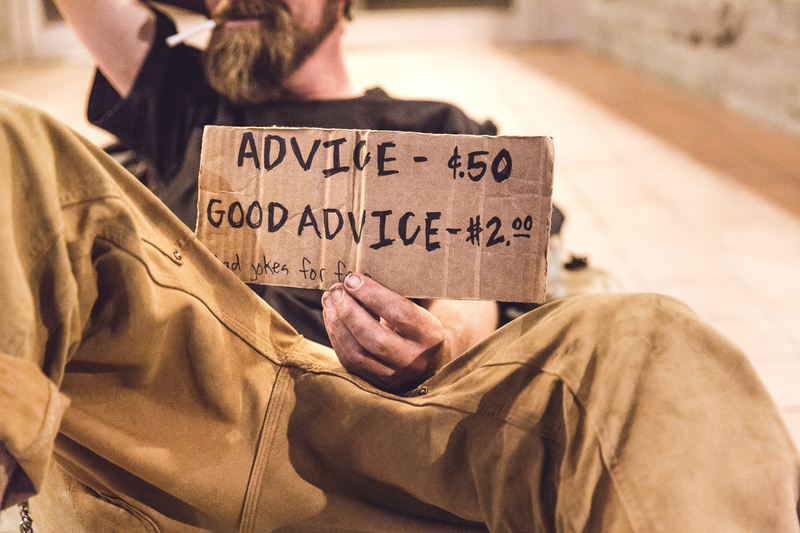 Misinformation can divert people away from a cause, such as claims that social problems like poverty cannot be solved (it can, and we are already halfway there). Misinformation can also cause people to become diverted into supporting policies that are not beneficial or even harmful to society – for example, mandatory minimum sentences for drug offenses. Unfortunately, it is very easy for well-meaning people to see something clever or entertaining on social media and share it without first checking to see if it is accurate. Fortunately, with a little research, mistakes like these can also be easy to avoid. Detractors are people who disparage activists without contributing to the conversation in a positive way. These are also the people who will criticize sharers for being “slacktivists” without contributing to a cause themselves in any way. Detractors can be particularly harmful because they can discourage sharers from spreading the word about causes they care about, and prevent them from moving on to become supporters. Detractors can even de-motivate champions and leaders with manipulative tactics and targeted attacks. Thinking about where you are on this pyramid, where you would like to be, and what is getting in your way can be a helpful framework for moving forward and creating meaningful change. Now go out there and make a difference! If you would like more information on how to take action and move up the pyramid, my blog also has tips for social media activism, charitable giving, volunteering, and advocacy. As always, thanks for reading!